Last year by mid June the Island Turtle Team had recorded close to 30 nests – 24 on the Isle of Palms and 5 on Sullivan’s Island. By July 1 there were 47 nests on these two islands. But it is quite a different story this season. There are only five on the Isle of Palms, including our leatherback nest, and one on Sullivan’s. You might think this would be cause for alarm. Has the loggerhead population suffered a catastrophic crash? Fortunately this is not the case. 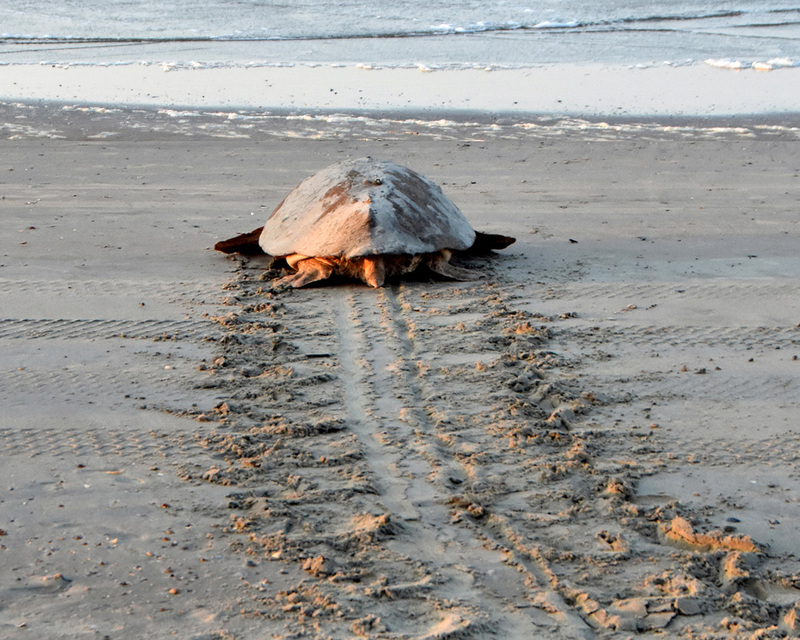 Records have been kept since the early 1980s on the South Carolina beaches with the heaviest turtle nesting. These index beaches include Cape Island, Lighthouse Island, South Island, Edisto Island, Edisto Beach State Park, and Fripp Island. About 44% of the state’s loggerhead nests are laid on them. The population, measured by nest numbers, has been slowly increasing in the past 35 years but has still not recovered to the levels of nests in the 1970s when there were 2,000 nests being laid on Cape Island alone. One reason for the recovery is likely the introduction of TEDs (turtle excluder devices) which allow turtles to escape from trawler nets before they are drowned. Couple this with the efforts of SCDNR nest protection from projects such as ours where hatch success has gone from around 10% to as much as 90% to see a definite upward trend in the population. Currently the average on Cape Island is about 1,000 nests. This season Cape has had about one fifth of their usual number so far. Looking at a bar graph of nest numbers on these six index beaches, you would notice that approximately every four years nest numbers take a noticeable dip but then rebound to a normal high for the next three seasons. This proves true not only for South Carolina but happens all along the Atlantic coast when it occurs. We remember that in 2004 we were part of a really low season statewide when we had only 8 nests on Isle of Palms and 2 on Sullivan’s. Then in 2014, another low nesting year in SC, there were only 11 on IOP and 6 on Sullivan’s. Four years later it looks like it is again one of those years. The genetics research project we have participated in for the last nine years shows us that most loggerheads nest every other season with some taking two or even three years off between seasons to rebuild their physical and nutritional reserves in order to produce up to 800 protein rich eggs in one summer. So every season we see a different set of females come ashore to lay eggs. Our best year ever was 2012 when there were 61 nests on the IOP and 6 on Sullivan’s for a total of 67. For these reasons we will try not to worry about where our mother turtles are this season. We hope they are taking a welldeserved rest and will return in full force to our beaches in 2019.